The healthcare industry needs a SWOT analysis so that it can ensure that organizations are aware of the level of their functionality and the current condition of the services that they provide to their target audience. 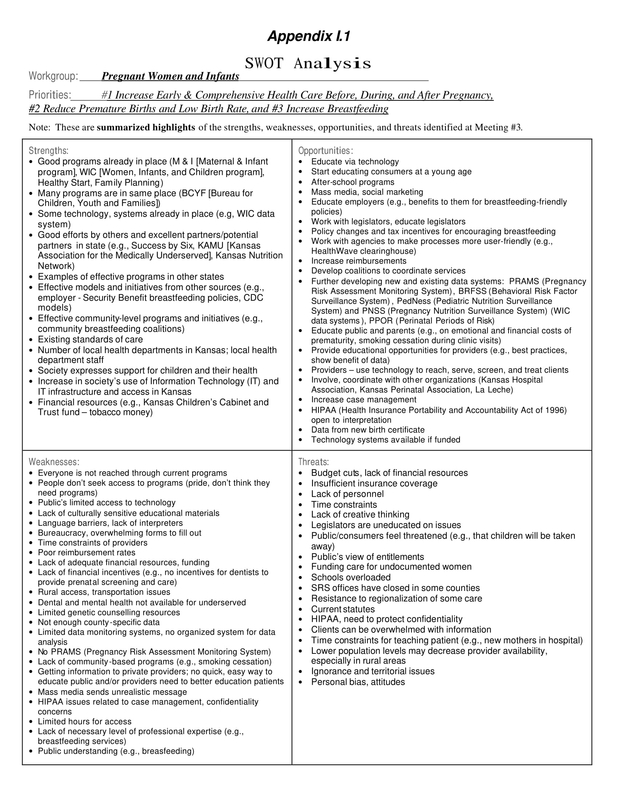 A healthcare SWOT analysis can be used to assess or evaluate healthcare offers, products, services, and organizations. The same as when you are creating a hospital SWOT analysis, you have to ensure that you are aware of the target and purpose of the healthcare SWOT analysis that you will be making so that you can achieve or get the results that you expect to have. To serve as your references and guides for formatting and content development, a list of downloadable examples is made available in this post. Browse through the selection of healthcare SWOT analysis examples that we prepared for you so you can be aware on how you can create a healthcare SWOT analysis for your organization. Have you ever tried to create a website strategy plan or other kinds of strategic action plans? Before you can come up with an effective strategic and tactic listing, you first have to conduct a SWOT analysis that can help you address the issues and concerns within the existing state of your organization. This can also be applied when planning programs, activities, and processes within the healthcare industry. A healthcare SWOT analysis is used as a tool by healthcare organizations to ensure that clinical managers and heads are aware of the current condition of their performance as well as that of the team’s. The way healthcare officers function can affect the overall potential and successes of the organization. This is the reason why a healthcare SWOT analysis should also provide details on how involved entities impact the proper allocation, monitoring, maintenance, and/or usage of healthcare resources. A healthcare SWOT analysis is commonly developed if a healthcare organization decides to prepare plans of action for a new undertaking. Some instances where it is necessary for a healthcare SWOT analysis to be made include the scheduling of internal and external healthcare audit, assessment of current healthcare practices, and checking of the implementation and incorporation of quality standards in all healthcare services. A SWOT analysis can measure the capabilities of the healthcare organization and it can also identify the external factors that can affect the functions of the organization. A healthcare SWOT analysis is a document that can be used for the proper planning of activities or programs that any healthcare organization would like to be a part of. A detailed and complete analysis can be very helpful for the team to come up with sound and effective decisions. 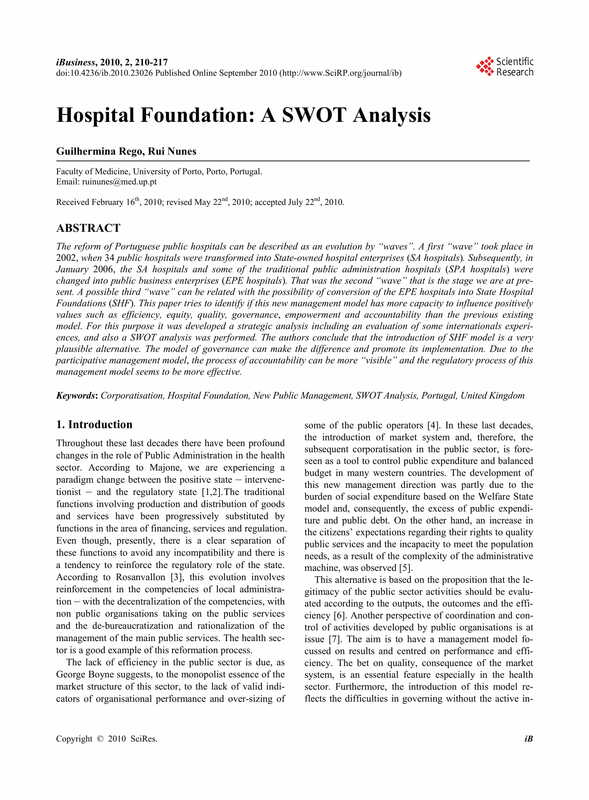 Since a healthcare SWOT analysis deals with the specification of the strengths and weaknesses of the healthcare organization, there will be clarity with how the organization can resort to the qualities and characteristics that they are good at so that particular weak points can be improved for the benefit of all entities involved in specific healthcare transactions. 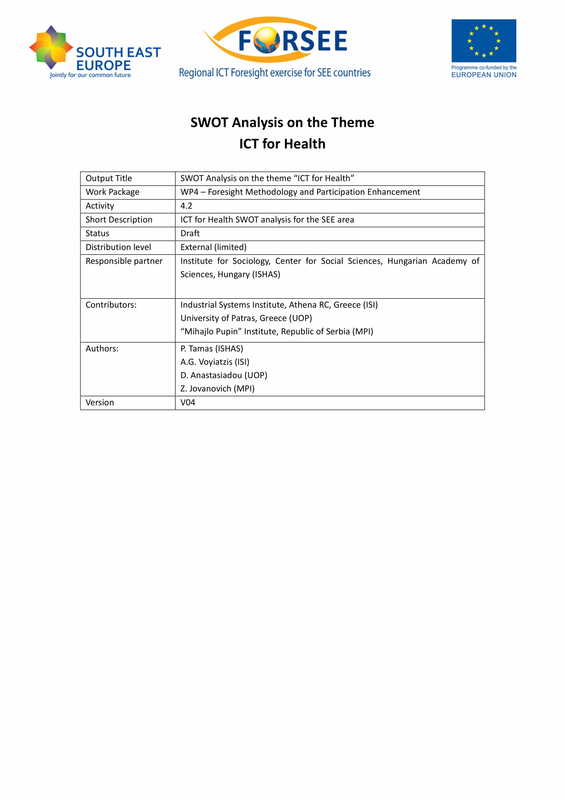 A healthcare SWOT analysis provides an idea on how the available resources of the healthcare organization can be used to supply the needs of its patients and other stakeholders. 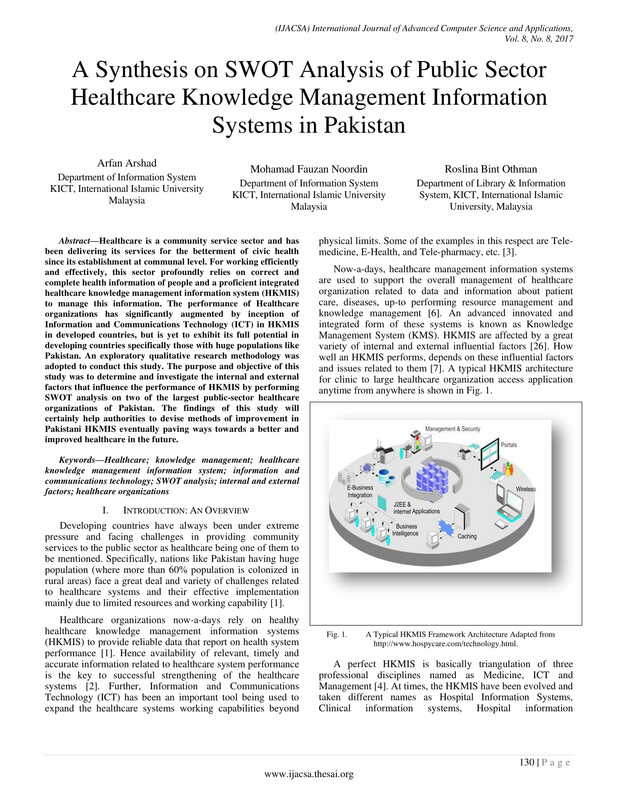 Moreover, this document can guide the proper analysis of particular activities and work functions which can affect the efficiency of clinical systems and healthcare procedures. When looking into these matters, you have to make sure that you will also consider the threats that the healthcare organization is facing as well as the opportunities that it can get from the external environment. Take note that there are different kinds of healthcare SWOT analysis documents that can affect the details that you can specify in each of them. 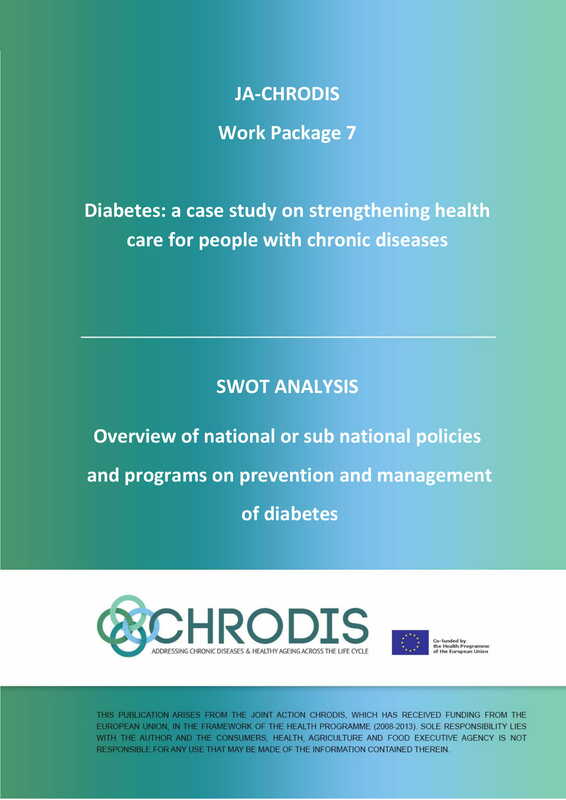 Not all the associations of the document’s usage in the healthcare industry as specified above can be applicable to all types or kinds of healthcare SWOT analysis. Come up with a goal that you would like to achieve with the help of the healthcare SWOT analysis. You need to ensure that your objectives are specific, measurable, attainable, relevant or realistic, and time-bound. Knowing the things that are expected to be the end result of the healthcare SWOT analysis development will allow you to take note of the key steps that you must follow so you can realize the vision that you have made in the initial parts of the undertaking. Assess the strengths of the healthcare organization. It can be about the quality policy that it follows, the level of service that it can provide to its clients, and any other items where the healthcare organization is known to be good at. These strengths should be based on the positive impacts and effects of the operations of the healthcare organization to its target audience. More so, you have to make sure that you will align the presence of these strengths with the objectives that the organization would like to achieve. List down the weaknesses of the clinic or the healthcare organization. There are different factors that can result to the presence of operational weak areas and existence of underwhelming healthcare services. You should not veer away from presenting these information as knowing the hindrances for the achievement of the objectives of the healthcare organization can make it easier to look into particular matters that are needed to be improved and developed. As much as possible, present the negative impacts and effects of these weaknesses so you can also identify the call-to-actions that can serve as resolutions and answers to any problem or concern at hand. Provide a list of the opportunities in the healthcare industry. There are different kinds of opportunities that you can get, but always remember that not all opportunities are good for your organization. You have to think of the impacts that it can provide to your operations as well as the relevance of specific opportunities to your goals and aspirations. More so, you have to consider the capabilities and deliverable of the organization so that you can ensure that you can sustain the monitoring and maintenance of particular opportunities when acquired. If opportunities can provide positive effects to the healthcare organization, there are also other external elements that can negate, delay, or hinder the growth of the organization and its operations. Threats are necessary to be given focus with as you need to identify the ways on how these can affect your operations and your relationships. Ensuring that you are prepared to face threats can help you protect your objectives and goals. There are some healthcare SWOT analysis documents that may require you to include your insights, recommendations, and/or suggestions. 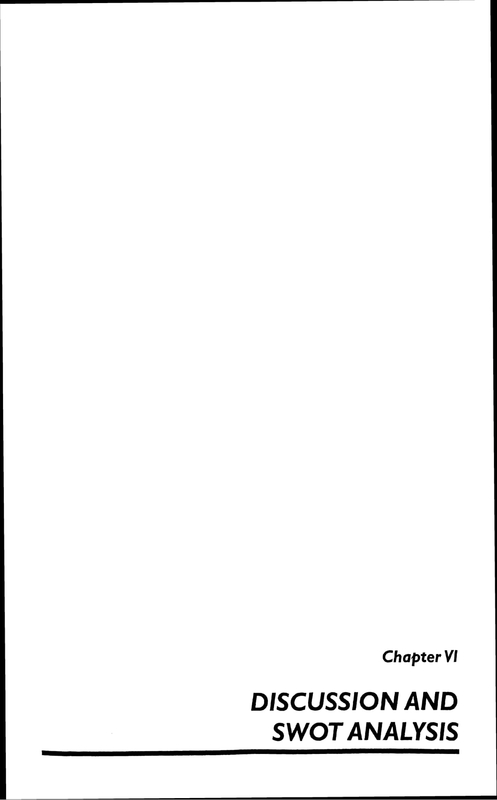 This is most likely to happen when the particular analysis is a part of a business plan. Hence, you have to ensure that you will take note of all the requirements and instructions for the healthcare SWOT analysis development so you can deliver all the expected outputs that should be seen by your target audience in the document. Making a healthcare SWOT analysis can be crucial as there are technical elements that you have to consider so that your discussion can be as credible and as highly functional as possible. If you think that you will have a hard time in making the specified document, what you can do is to first stick with the basics of healthcare SWOT analysis development and update or improve the document as you progress. The steps that you can follow if you want to begin the development of a healthcare SWOT analysis for your organization are listed below. If you want to ensure the effectiveness of the healthcare SWOT analysis that you will be making, you have to list down all the expectations of the entities who tasked you to develop the document. Align your presentation with these expectations and ensure that you will deliver or provide all the details that are needed for the healthcare SWOT analysis to be deemed complete and well-formulated. Develop a timeline that can guide you and the entire team with the duration of each analysis procedure. This can also set the scopes and limitations of the healthcare SWOT analysis as there are already time frames that can identify the occurrences of the items that you have analyzed. Hence, developments and updates can be noted in the future. Gather a team that you will be working with in all the processes of the healthcare SWOT analysis. It is important for you to make sure that there is enough manpower that can provide their expertise and deliverable for the achievement of the healthcare SWOT analysis goals and objectives. Have an end goal in mind and ensure that you will disseminate and share the information about your goal. Your entire team and other entities involved must be aware of what you would like to achieve so that you can all have a collaborative effort that will allow you to get the things that you want as a group. Focus your time and efforts for data collection. It is critical for you to collect all the details that you need so that you can have a thorough analysis. The information that you will put together must be based on the healthcare SWOT analysis goals and objectives. Ensure that you have selected a suitable system for data collection so that it will be efficient and easy for your team to list down all the information that is needed for the document. Once you already have all the details that you need, the next thing that you should do is to filter all the data and group them based on the elements or segments of the healthcare SWOT analysis. List these details on the groupings where they correspond, whether they are considered as your strengths or weaknesses or whether they are included in the external factors that you need to watch out for. The same as when you are tasked to develop a hazard analysis, be critical with your assessment and ensure that there will be an objective and transparent analysis of the co-relation of all the details that you have listed. Do not be vague with your statements and results specification as you need to come up with a detailed discussion of how these elements can affect your operations. If necessary, draw your conclusions and recommendations based on the results of your SWOT analysis. Give highlights on how these elements impact your healthcare operations. Review the final document before disseminating it to your target audience or using it for decision-making processes and other actual transactions. As we have specified above, you have to make sure that you will be objective and reasonable when making the document. You have to ensure that your healthcare SWOT analysis can also give the details about the weaknesses of your organization. More so, it should also allow your stakeholders to be aware of the threats that are present in the environment. Downplaying or hiding threats and weaknesses can only result to more problems in the future especially if they will not be addressed. Stick with your goal within the entirety of the healthcare SWOT analysis development. There are factors that will require you to change your strategies, action plans, and methods. Even if this is so, you still have to make sure that you are working with a goal in mind. Being able to do this can help you become adaptive to changes without losing the main reason on why the analysis is needed to be created. 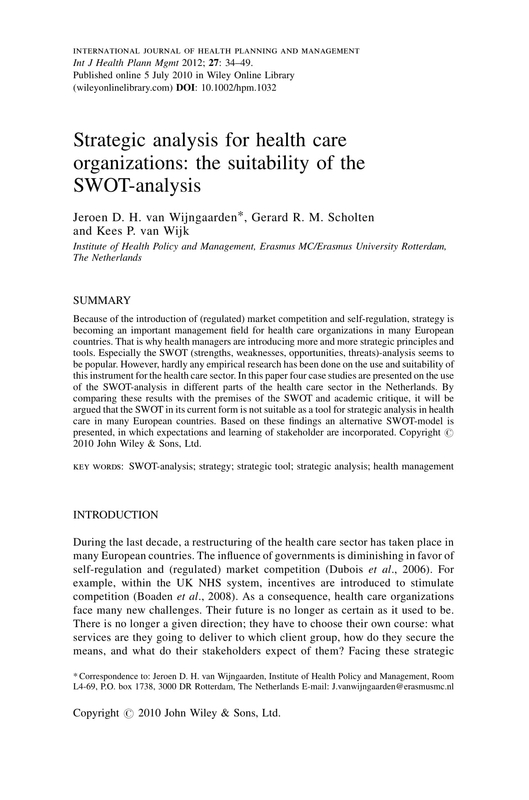 Identify the usages of the healthcare SWOT analysis. Knowing the tasks, processes, and procedures where the document can be beneficial can help you to give more focus in areas of discussion where particular information can be maximized by the organization when making decisions. Make sure to refer to the downloadable examples in this post before starting the creation of your own healthcare SWOT analysis. More so, we hope that you will browse through and take a note of the guidelines that we have listed alongside the examples that you need. Create a healthcare SWOT analysis now and see how it can further improve the operations of your organization, the allocation of your healthcare resources, and the ability of your team to provide the needs and reasonable demands of your audience and clients.